Twenty-two teams were on hand for the 10th annual St. Michael the Archangel Warrior Open on Saturday, November 7th. Half of the teams were from the Greater Baton Rouge areas, but others came from the New Orleans and Lafayette regions, and one, Airline, from northwest Louisiana. While the job of coaching the Warriors has been entrusted with Holy Cross's 1983 Division I state champion Mark Harter (photo left), the tournament was once again conducted flawlessly by Coach Kris Kienzel (photo right), who made sure the event was over soon enough for most competitors and attendees to get home or elsewhere to watch the LSU-BAMA game that evening. (A nice gesture, but maybe they should have had another tournament instead). Jesuit champs Eli Larriviere, Adam Larriviere, Joseph Dupre and Brandon Greer. The Blue Jays also had three runners-up, and third place finisher and two fourth-place finishers. 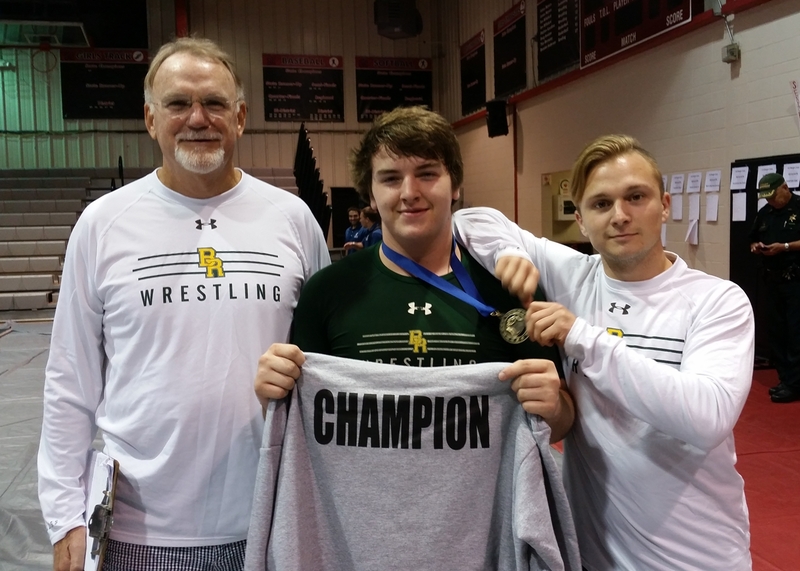 St. Amant had three champions: Clint Brownell (also an OW), Sage Nugent and Cameron Borne. One Gator was a runner-up, three placed third and one placed fourth. Airline had two champions in Tony Lococo and Keegan Gilligan. Four other Vikings placed fourth. Catholic did very well also, with champions in Cameron Carpenter and Nick Danna. Two Bears were runners-up, one placed third and one placed fourth. Last year's fourth-place Division I team does not, as the LWN editor surmised earlier, look to be any weaker than last season. Re nest season, the Bears should be very tough, as this year 75% of their TrackWrestling roster are juniors or younger. Other champions were Rayne's Cooper Simon, Ethan Alphonso of Live Oak and Chase Stuckey of Baton Rouge. Winning via a technical fall, a 10-6 decision over a reigning Division II state champion, and a finals pin in 4:50, Rayne's Cooper Simon, at 106 lbs., was voted by the coaches to be the Outstanding Wrestler of the lower weight classes. At 152 Lbs. St. Amant's Clint Brownell pinned his first three opponents in 0:14, 2:20 and 1:20, and then shutout his finals opponent 6-0 to be voted the Outstanding Wrestler in the heavier weight classes.